The below tale that takes you through different times of life, is also sure to help you realize the importance of belief in one's life! They say the boats still wait. Gently swaying at the edge of the sea, they wait. Why? For whom? Or what? To answer those questions, you'll have to go back to the time when your great-grandfather was a child. That was a time when people still believed in magic. They saw miracles every day, and they thanked Heaven for them. They believed in fairies, and in elves and imps. They believed that four-leaf clovers brought luck, and that Santa Claus came down the chimney with toys. And because they believed, these things were true. Then, your great-grandfather grew up. And your grandfather grew up. As each generation grew, they explained everything with chemical reactions or electro-magnetism or logical conclusions. And if they couldn't explain something, they shrugged it off. They didn't believe in it. When people stopped believing, the boats stopped journeying forth. But if you go a few yards left of the rainbow, just a tad to the right of the bent palm tree, you'll see the boats, gently swaying. If you're lucky, you'll hear the music. So when your great-grandfather was a child, and people believed, they told the story of the lost violin. "It was the best violin in the world," mothers told their children, as they tucked them in to bed. "It played the music of the clouds," fathers said. "It played the music of the clouds, the grass, the brook and the birds." "It knew the secrets of the mountains and the valleys. It whispered of lightning and sang of thunder. It echoed the rhythm of the butterfly's wings. It roared like the king of the jungle. It gave hope, it gave courage, it gave the gift of happiness." "Who played it?" asked the children. "Invisible folks. Some say it was the fairies themselves. Some say it was the grasshoppers, or the baby rabbits. No one knew for sure. 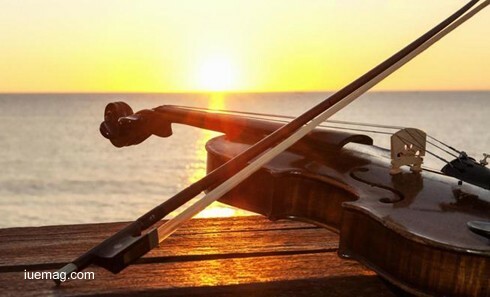 But each day, every day, at sunrise, at moonrise, at the moment when the evening star was brightest, the violin would play. And each day, it would give hope to the desperate, courage to the meek, health to the sick and joy to the unhappy." "That means nobody was desperate, or meek or sick or unhappy," the children pointed out. The parents smiled. That's what it meant. Then, the smiles faded. "One day," said the mothers and fathers, "one day, the violin missed the sunrise. It missed the moonrise. It missed the moment when the evening star was brightest. It even missed the first drizzle of the summer." The violin had been lost. Stolen. It took them a while to believe that this had happened. The violin could not have been stolen! The violin belonged to everyone, who would want to steal it? Why would they steal it from the fairy folk, from the grasshoppers, the baby rabbits, steal it from themselves? But they had to face the truth. The violin had, in fact, gone. It had been stolen. "What does it mean, when something is stolen?" the children asked. "It means it got taken away," the parents replied. "Like you took away my doll when I was naughty?" "No. Not like that. It means they took it without asking, when they shouldn't have. It means they never wanted to give it back." "So it was theirs, then, if they never wanted to give it back?" That question put the parents in a quandary. To whom does a stolen object belong, if it is never to be returned? Does it belong to the thieves, then? But the violin would not play for the thieves. To whom does a stolen object belong? The only clue the folk had was the whisper of the wind. The wind had seen the thieves, or heard them. "Across the sea," the wind said. "Across the sea." So, the brave, the healthy and the happy set out. They set out in boats, to look for the lost violin. For many days and many nights, they travelled in their little boats. To islands, to lagoons, to deltas and to reefs. They rowed and they sailed. Not a sign of the lost violin. "Where?" they asked the wind. "Across the sea," the wind replied. "Across the sea." "That's where we are," they replied, tiredly. "We are across the sea." They were not so healthy any more. Slowly, they became less happy. But they did not lose their courage. When they grew weary, they returned home, and, instantly, others took their place. "Where did you sail? Where did you search?" the others asked. "There, where the clouds form a swirl. Where the waves dash against the cliffs." "Then we shall go the other way." Sometimes, the searchers hummed as they rowed or sailed. They hummed, so they would not forget the tunes the violin had taught them. The boats heard voices humming as they searched. They heard voices, and then other voices, and then other voices . . . humming. The boats learnt the song. So, when searchers who did not know the song boarded the boats, the boats hummed. And the searchers found strength in their arms, to row. They felt keenness in their sight, to seek. There were skeptics. "You'll never find it," some said. "You didn't look properly. If you had looked properly, you would have found it by now," others claimed. Is that true? If you haven't found something, it means you didn't seek properly? The searchers wondered. But the skeptics had more hurtful things to say, "I don't think the violin exists at all. You just made it up, so you could go sailing." Sometimes, they thought they saw it, the violin. High atop a peak, or low, low, down, beneath the clear waters of the ocean, they thought they saw it. Always, it was just a shadow. A mirage, maybe. Perhaps it was their hope, flying from their minds and hearts to the heights of the mountain ranges or the depths of the seas. Always, they resolved to search more, to search harder, to tell the next batch of searchers where they had almost seen it. It was when the hundredth batch of searchers was returning that the mermaids surfaced. "You are weary, but tell your brethren to follow us," they sang. "Let fresh hands rig the sails, let fresh hearts set out. This time, we shall lead them. We know where they must go, to find the lost violin." And the weary searchers raised their eyes to Heaven and said a prayer of thanks. They embraced each other, and, arms linked, looked eagerly to shore, to tell those waiting that they would succeed, that the mermaids would help, that the quest was at its end. But there was no one waiting at the shore. Again, it took them a while to believe it. The new searchers were going to succeed! The mermaids would help them. Fresh hands, fresh hearts, they said, They would help them. The violin would come home, in the boats, with those who took over. But there was no one to take over. The boats stopped abruptly, lurching in to the squelchy sand. The searchers jumped off the boats and went in search of their people. Visions of the lost violin returning gave them strength. They could almost hear the pure notes again. They had failed in their quest, but the next group would succeed. Now, they had to search for those who would take over. They hummed as they searched. Hours went by. Days. Weeks. The searchers were beginning to grow weary again. Hope was beginning to dim. They tried to recall what they had seen, heard and felt when they were on the boats. They repeated the message of the mermaids. They held hands, they helped each that stumbled. It took all their courage, but they kept searching. Many weary steps later, they found their folk. It took them a while to recognise each other, the tired searchers and their folk. They found their folk in malls, in skyscrapers, in fast-food joints and in reality shows on television. They found them in the stock exchanges, in corporate conglomerates, in the rat race. They found them in the luxury resorts, the golf courses, the casinos and the discotheques. "We were looking for the violin," the searchers told their folk. "You must go now, the mermaids will help you find it." "What violin?" the folk said, and then, before the searchers could answer, they asked to be excused, because their mobile phones had beeped. "What violin?" the folk said, and then hushed them as they tried to answer, because the commercial break was over and there was a big announcement coming on about who had won the pageant. Soon, there was no one left who knew about the violin. No one except the boats. Unmoored, unfettered - yet motionless except when the waves gently rocked them. The tide never seemed to change, there, at the edge of the sea, where the searchers had left their boats. So the boats remain. If you go a few yards left of the rainbow, just a tad to the right of the bent palm tree, you'll catch sight of them. If you really, really, believe, the boats will hum for you. They will hum the forgotten tune of the lost violin. And if you're very lucky, you'll see some silhouettes in the water, and catch a glimpse of a fin or two. For, when someone really believes, the mermaids will return to help them find the lost violin. Any facts, figures or references stated here are made by the author & don't reflect the endorsement of iU at all times unless otherwise drafted by official staff at iU. This article was first published here on 17th January 2017.